India’s governments have focused on wrong ideas, wrong economic models for long. There is a new path to make Indians prosperous - Nayi Disha, Dhan Vapasi. In a year or less, we will have elections. Pakistan, polarisation and of course the good old reliable buzzword of poverty will occupy centre-stage. How about we upset the game of the politicians and make the election about a new idea – prosperity? Prosperity has long eluded Indians. 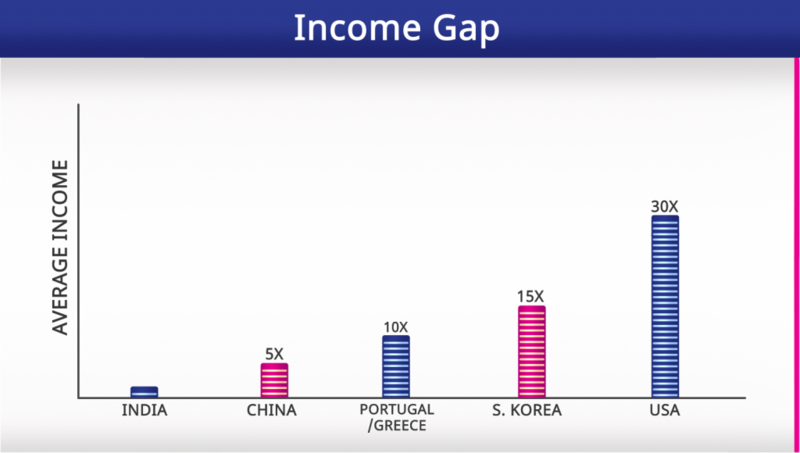 Income of an average American is 30 times that of an average Indian, the South Korean has 15 times higher income, the Portuguese and Greek 10 times more and the Chinese about 5 times. Why have we in India not been able to create prosperity? Why have Indians stayed so poor? The answer lies in our almost exclusive focus in dealing with poverty. All efforts are at “poverty alleviation” – from Garibi Hatao to its modern-day variants. Poverty is the default state in the world. The question to really ask is, “What creates wealth?” Prosperity is what needs action, not poverty. By focusing on poverty, governments end up destroying wealth rather than enabling its creation. The ‘pabandis’ they put perpetuate poverty, rather than accelerating prosperity. Human actions tend to focus on striving for prosperity; most government actions tend to put up barriers for people. For too long, India’s governments have focused on the wrong ideas and wrong economic models. Indians should have been 10 times richer – but are not. India’s governments have stolen 90% of the wealth of Indians. What’s the new path and direction? There is a new path that can make Indians prosperous. It is “Dhan Vapasi”, the return of the public wealth to Indians. The share of the public wealth of every Indian family is over ₹ 50 lakh – only, it is locked up in land, PSUs and minerals, and further compounded by wastage. Wealth begets wealth. Every Indian family can be returned ₹1 lakh every year, with taxes being cut simultaneously. This is the change India needs. Change always has to start with us. When we start understanding the path needed for prosperity, only then will politicians change their actions to meet our demands. This is Nayi Disha’s mission. Together, we can make the next election about prosperity and dismantling of the anti-prosperity machine. Together, we can elect India’s First Prosperity Prime Minister. When we launched NayiDisha.com a few months ago, we started with an economic manifesto and a political platform. What we realised is that the political platform comes in the way of understanding and spreading of the ideas of Nayi Disha. So, we are dropping the political platform and making Nayi Disha about a single focus – spreading the ideas of prosperity, especially Dhan Vapasi. Going forward, we will help you understand what causes wealth. We will explain public choice theory to give you a new lens to understand the actions of those in power. We will dig deeper into the importance of economic freedom. We will also help you understand the right role for government – what it should be doing, and what it should not be doing. We will also show how Nayi Disha’s Five Prosperity Principles and Five Starting Solutions can truly put India on a new path to prosperity.